There have been so many stories in the newspaper this week that we are just going to concentrate on the biggest headlines and skim through them. We'll stick to the 'nice' stories only and not talk about North Korea's hydrogen bombs, or the nasty gangs in Cologne, or anything else like that. Let's just have some feel-good stories to make us feel happy. Now, some of these are huge stories, and some of them are just ridiculous. 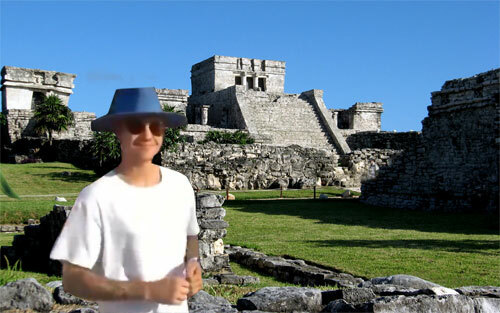 Justin Bieber has been kicked out of Mexico, for climbing on archeological ruins and dropping his trousers, to do an impromptu moony. The ancient Mexican ruins in Tulum were briefly treated to a view of his rear as he acted the clown once again. We thought that Justin Bieber was behaving in a more mature manner these days. Wonder if he'll be saying 'Sorry'! Eddie Redmayne was spotted buying fruit in the supermarket, and Kerry Katona was seen pushing a shopping trolley. 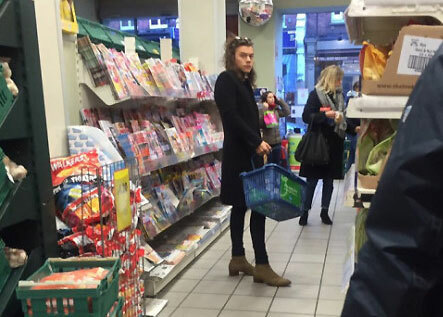 Harry Styles was also papped in a supermarket carrying his shopping basket. We're not sure which supermarkets these were though. Staff in a Sussex branch of McDonald's called a fat woman fat when she ordered six burgers, allegedly. The story took a bizarre turn of events, when the branch manager played back the CCTV footage to prove that this didn't actually happen at all, only it didn't have sound because there is no microphone on the CCTV camera. Therefore, the video footage did not prove anything, other than perhaps how dopey the staff were thinking that it would. 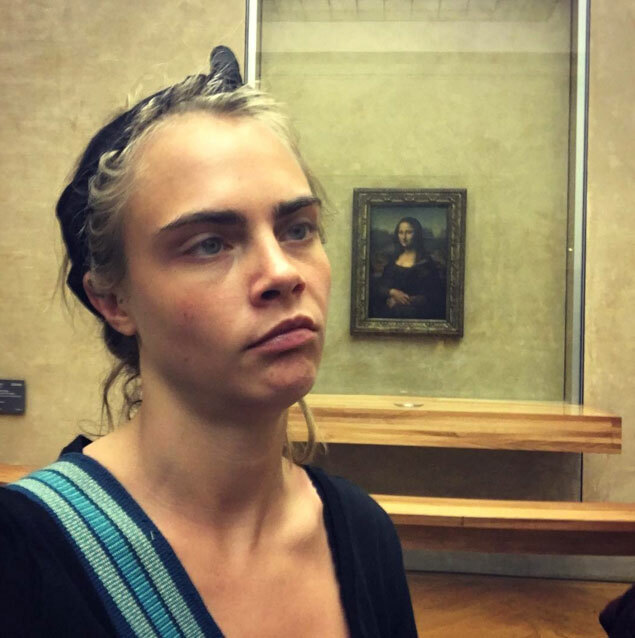 Cara Delevingne took a series of selfies by the actual Mona Lisa painting in the Louvre gallery in Paris this week. She claimed that the painting was 'flirting' with her, as she posed and pouted for her 25 million followers on Instagram. For the first time in chart history, the same person is number 1, number 2 and number 3. Yep, its Justin Bieber, with 'What Do You Mean?' at 3, 'Sorry' at 2, and 'Love Yourself' at number 1, which was written by the lovely Ed Sheeran. Good work Eddie, or Ed Shez as we like to call the little ginger rascal. 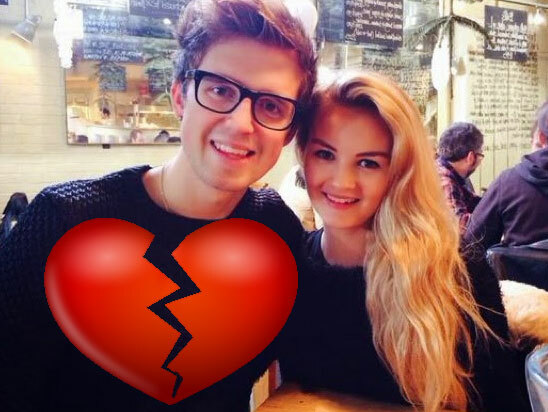 World-famous YouTubers Marcus Butler and Niomi Smart have broken up, and left the Internet heartbroken. Marcus announced this sad news via a YouTube video, and genuinely seemed very upset about this conscious uncoupling. We are not sure what is going to happen to their fledgling snack business though, which is called 'SourcedBox', because they source food and then put it in a box, presumably. Jennifer Lawrence says that she can't stand New Year's Eve, because she often ends up getting drunk and throwing up. We recommend a very simple solution to this problem J-Law - maybe just don't drink as much and try to get an early night. You'll feel much better the next day then, no doubt about that. Joe and Caspar Hitting the Road Again? Caspar Lee has hinted that he is going to film a 'Hit The Road 2' sequel movie with his mate Joe Sugg. We're not sure how true this actually is, and more importantly, whether or not this is a good idea in the first place. We enjoyed watching their film, but another one so soon? Perhaps this isn't one of your better ideas guys and you should stick to pranking each other instead. You are really quite good at that. Rumours have it that Harry Styles has written and recorded some solo songs already, after fellow One Direction band members all agreed to take a year out to recover after their gruelling tour schedule last year. The singles that he's said to have recently recorded are named Already Home, Cocoa, Endlessly, and 5,285 Miles - or something like that. Can't wait Harry, but maybe get your hair cut in the meantime.